PlastiLine MMA 51 Primer is recommended for priming of concrete, cement screeds, ceramic tiles, asphalt in wet or dry areas before top coating with PlastiLine MMA Cold Plastic systems. High solid road marking paint. PlastiLine 1C Methacrylate SB is formulated as a higher solid, high performance line marking paint for markings on freeways and highways as well as road markings in towns and villages exposed to less wear. High solid road marking paint. PlastiLine 1C Waterborne is formulated as a high solids waterborne traffic paint for traffic applications such as highways, local roads, intersections and crosswalks, landing strips and parking lots with our without reflective glass beads. PlastiLine MMA Cold Plastic Spray is applied in layers of 0.3-1 mm primarily on asphalt road surfaces either by using hand or automatically driven cold plastic machines. PlastiLine Polyurethane has been formulated as a two component, extremely durable, liquid marking system for application to asphalt and concrete surfaces in high traffic areas such as stop streets and traffic lights. 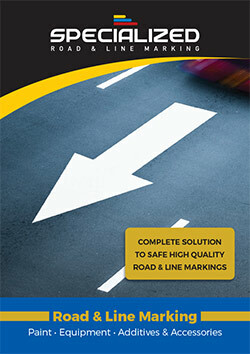 Applied by sophisticated road marking equipment, that includes a heating ‘cooker’ and specially designed application accessories, the thickness of application is 3mm extruded and 1.2mm spray applied. This product provides many times the longevity when compared to conventional solvent or water based paints. Glass microspheres for reflectivity in low film thicknesses.